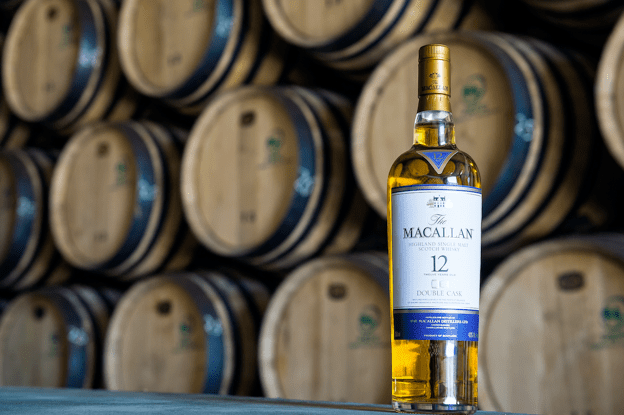 Macallan fans, as a rule, love its sherry-casked expressions but bemoan the existence of its bourbon-casked ones, namely the Fine Oak line (although the latter sees a bit of sherry finishing). At last Macallan has come up with a way to bridge the gap between the all-sherry Sherry Oak line and the sherry-minimal Fine Oak. The new line: Macallan Double Cask, a new style of whisky from the company. And it’s even got an age statement, folks. So, to clarify, it’s a blend of whisky held in two types of casks: new American oak that’s been sherry seasoned, and standard European oak sherry casks. Note that there are no bourbon casks used in any of this; it is, in one sense, a 100% sherry-aged whisky, albeit an unconventional one. As of now, there’s only one whisky in the Double Cask collection: this 12 year old bottling. Macallan hasn’t said anything about a line extension yet, but all signs seem to point to this as merely a starting point, presuming it does well in the market. This is a well-rounded, even delightful expression of Macallan, showing off a nice balance between traditional American wood and sherry cask aging. On the nose, the sherry influence clearly dominates, though sharp orange peel and winey notes find balance in some caramel underpinnings. On the palate, a complex array of flavors await, beginning with fresh cereal before moving into more citrus, plus notes of coconut, caramelized banana, and even a curious touch of mint. The finish is lengthy but soothing and gentle, surfacing more of those new wood-fueled vanilla notes, a bit of leather, and some black pepper, which adds some grip to the otherwise lithe and supple body. Great balance from start to finish, and though it drinks a touch on the young side, it’s quite enchanting as a whole. All told, it does “taste like Macallan,” the malt and sherry components combining for a surprisingly familiar (and somewhat simple) experience, double casking be damned. Die-hard Macallan fans won’t have any complaints here. The rest of you ought to give it a try, too. I recently bought a bottle of the 12 year double cask Macallan. I find it to be very pleasant, and delightful. I do drink bourbon, and you can tell that virgin oak casks without bourbon had been used in the process. two thumbs way, way up.